"We've created the next chapter in natural selection." Warner Bros has unleashed the second official trailer for Brad Peyton's adaptation of the video game Rampage, starring Dwayne Johnson as a primatologist and friend of a giant ape. We posted the first trailer late last year, now we finally have the new trailer with some extra footage of the giant monsters that terrorize the city. Rampage is a live-action version of the 80's video game about apes and monsters destroying buildings - which is all it really is about. 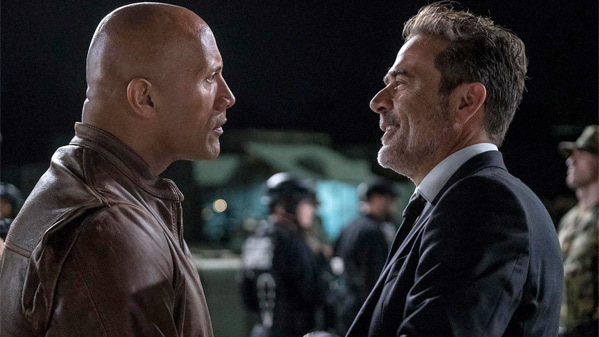 From the director of San Andreas and Incarnate, the cast of Rampage includes Jeffrey Dean Morgan, Malin Akerman, Joe Manganiello, Naomie Harris, Marley Shelton, Jake Lacy, Breanne Hill, Jack Quaid, Joey Thurmond, and P.J. Byrne. This still looks way too much like a wannabe Pacific Rim movie, but without any of the giant robots. As much as we all love Dwayne Johnson (right? ), I have a bad feeling about this one. You can watch the first official trailer for Peyton's Rampage here, to see even more footage. Primatologist Davis Okoye (played by Dwayne Johnson) shares an unshakable bond with George, the extraordinarily intelligent gorilla who has been in his care since birth. But a rogue genetic experiment gone awry transforms this gentle ape into a raging monster. As these newly created monsters tear across North America, destroying everything in their path, Okoye teams with a discredited genetic engineer to secure an antidote, fighting his way through an ever-changing battlefield, not only to halt a global catastrophe but to save the fearsome creature that was once his friend. Rampage is directed by American filmmaker Brad Peyton, of Cats & Dogs: The Revenge of Kitty Galore, Journey 2: The Mysterious Island, San Andreas, and Incarnate previously. The screenplay is written by Ryan Engle, Carlton Cuse, and Ryan Condal. Warner Bros will release Rampage in theaters everywhere starting April 13th soon. Who's down?